This is my go-to vegetable sauce. It's quick, it's easy and it's delicious! It's the perfect match for boiled white rice. Take a break from fried tomato stew and try the Mixed Vegetables Curry Sauce today. The vegetables below are my favourite combination of vegetables to use but feel free to remove some of them and add your favourite vegetables. Just make sure that there's carrot in there because it gives this sauce a rich delicious taste. I use the soft chicken (cockerel or rooster) for this sauce because the sauce tastes better with it. If you are in the USA, use corn starch. If you are in Nigeria, make sure the corn flour you use is very fine. The corn flour sold in Nigerian markets are not so fine. 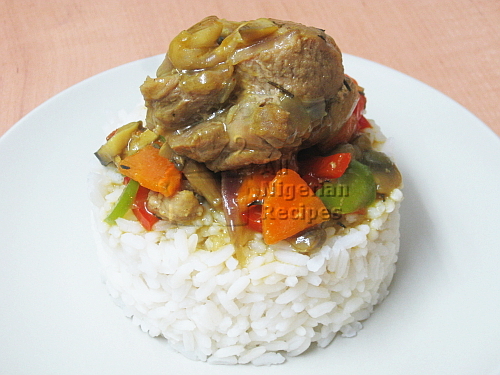 The curry powder used in this sauce is the curry powder used in Nigerian recipes NOT the hot and spicy Indian curry. Rinse all your vegetables very well. Scrape the carrot. 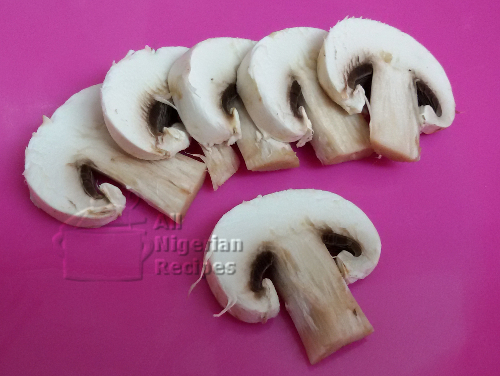 Cut the mushrooms into thin slices like this. Divide the onion into 2. Cut half into small pieces and cut the other half into long thin slices. Cut the red and green peppers into long thin slices. Cut the carrot into thin half moons. Set the pieces of chicken in a pot. Add the stock cubes (crushed), thyme and the half of the onion that you cut into tiny pieces. Pour water to the same level as the contents of the pot and start cooking on high heat. While that is cooking, mix the corn flour/starch with a small quantity of water to get the consistency of evaporated milk. Or a little bit more watery than evaporated milk. When the chicken is cooked, take them off from the pot and set aside. Leave the stock (water from cooking the chicken) in the pot. Stir, cover and continue cooking, again on high heat. Once it boils, add the peppers and the other half of the onion. Stir and continue cooking for 90 seconds. Add the thickener. Stir and add the chicken. Stir and add salt if necessary and it's done! You need to be careful so you don't overcook the vegetables. Serve with boiled white rice.